I don't see why one shouldn't be fascinated with the human form. We go through life in this wonderful envelope. Why not acknowledge that and try to say something about it? The challenge of compressing an entire month's thoughts is heightened when a flurry of events unfold on the first day of the previous month! 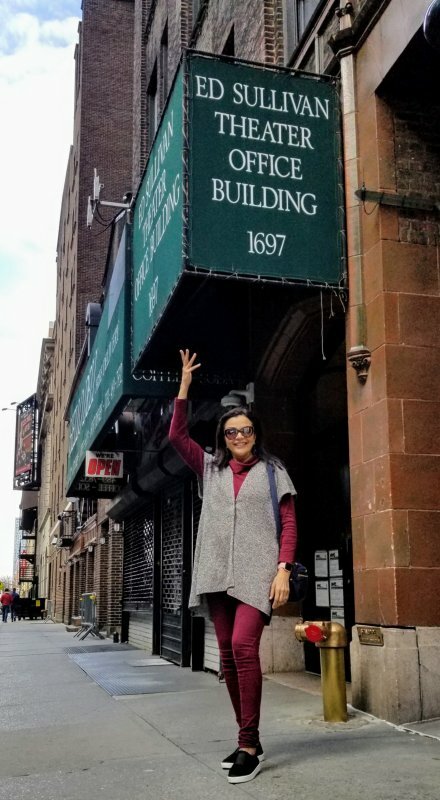 I write this from New York City, my former home for over a decade, where my two children were born and where I had an exciting career as a Television host and producer. This image is of me standing under the canopy of my former office. Inside the historic ED SULLIVAN THEATRE building on 53rd Street on Broadway, the same building that now houses the exciting late night talk show of the irrepressible STEPHEN COLBERT. 30 years since I left NYC and my previous life, it still continues to inform and energise me with its chaotic, eccentric energy. - After a gap of 8 years, the Tamilnadu Govt has announced KALAIMAMANI awards. Among the recipients are Bharatanatyam dancers Roja Kannan, Lakshmi Ramaswamy, Radhika Shurajith, J Suryanarayanamurthy, Priya Murle, Madurai R Muralidharan, Binesh Mahadevan, Latha Rajendran, P. Muralidharan and Niveditha Parthasarathy. Chennai based Sri Krishna Gana Sabha and Bharatiya Vidya Bhavan will receive awards for institutions. V.P. 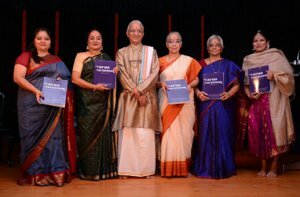 Dhananjayan and Shanta Dhananjayan receive the BALASARASWATHI MEMORIAL AWARD for Bharatanatyam, along with Vyjayanthimala Bali and Prof. C.V. Chandrasekhar. The award carries a cash prize of rupees one lakh and citation. - Kathak Guru Pratap Pawar received his MBE (Member of the Most Excellent Order of the British Empire) for services to dance, culture and community cohesion on March 19, 2019 at Buckingham Palace from Prince William. Kathak dancer Sujata Banerjee, founder of Sujata Banerjee Dance Company, received the MBE from Princess Anne at Buckingham Palace on Feb 13, 2019 for services to dance. - Farooq Chaudhry, co-founder and producer of the Akram Khan Company, has been made OBE (Officer of the Order of the British Empire) for services to dance and dance production. - At the sixth edition of Nayika symposium and dance festival hosted by Shambhavi School of Dance, the NATYASASTRA AWARD was given to Guru Radha Sridhar for her continued contributions to Bharatanatyam, on March 10, 2019 at Bangalore. - Chitra Arvind received BEST PERFORMER AWARD in Bharat Nritya Utsav on March 10, 2019 from Dr. Nalli Kuppuswamy Chetty, President of Sri Parthasarathy Swami Sabha, at Chennai. - Usha Raghavan, Bharatanatyam artist, Director, Kalasagara UK was honored in London on March 7, 2019 with SHE INSPIRES AWARD 2019 for Bright Artist - Promoting Art and Culture - by IIW (Inspiring Indian Women) Global, supported by Indo British All Party Parliamentary Group. - Shanta Dhananjayan was honoured with a LIFETIME ACHIEVEMENT AWARD by Raindrops Cultural Association, on March 23, 2019 at Rani Seethai Hall, Chennai. - Dr. Vasundhara Doraswamy was conferred the SINGARA KALA RATHNA by Singapore Kannada Sanga for her yeomen service to Bharatanatyam on 3rd March 2019. - Kathak dancer Seema Mehta, disciple of Pt Chitresh Das, was awarded NARI SHAKTI PURASKAR by the President of India on 8th March 2019, in recognition of her work to empower women through Kathak. - Over 7,000 Bharatanatyam dancers set a world record for the maximum number of people performing the classical dance form at the Natyanjali festival in Nataraja Temple in Chidambaram on March 3, 2019. 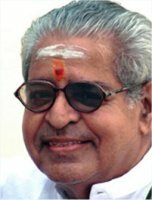 - Prof D Pasupathi, Carnatic musician and music composer from Kalakshetra, passed away on February 26, 2019. 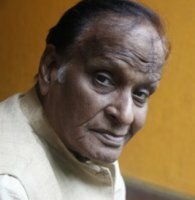 - Kathak Guru Ganesh Hiralal Hasal passed away on March 15, 2019. - Born on 22 April 1948, Kathak guru Pt Vijai Shankar, a disciple of Pt Birju Maharaj, passed away peacefully in his sleep on March 16, 2019. He also trained in tabla under Khalifa Ghulam Hussain Khan. Vijai Shankar trained many young Kathak dancers at his Shankar's Kathak Dance Research Centre in Kolkata and Varanasi. He received the Sangeet Natak Akademi Award for his contribution to Kathak dance. In cities across India, creative citizens and others gathered to express their anger and outrage at the recent political developments that seemed to welcome another war. These are some glimpses of the New Delhi event. Apart from music and dance, the audience at the 15 August Park at the Red Fort encountered an array of installation art, visual art stand-ups, and performances that spoke of resistance and of reclaiming India from the purveyors of hatred. The footfall on Sunday is estimated at more than 20000 people: men, women, children! The WORLDS of MOHAMANA is a compilation of mini films. VARNA VARNANAM, a compilation of rare Pada varnams and Tana varnams for both music concerts and natya compositions by Dr. Kanakam Devaguptapu, has a Foreword by Guru V.P. Dhananjayan. Kalavardhini arranged a two day festival of films on dance in collaboration with Pune's National Film Archive of India, and Loud Applause, on 16th and 17th February in two sessions a day. When Pavitra Bhat invited me to Mumbai for his new venture titled Kalahrnisham (Feb 22 & 23), meaning art day and night, which was given by his Bharatanatyam exponent wife Aparna Shastry, I was delighted to accept. I happened to be in Mumbai when Dr. Sandhya Purecha, disciple of Guru Parvati Kumar, celebrated his 99th birthday on 27th February at Ravindra Natya Mandir Mini Hall. March brought many interesting ideas and events to fore. I chose a few to show how dance matters in society or can. Vrityant weaving dance, spoken word, music and movement, was presented on February 9 in Kolkata by the US-based senior Odissi dancer Sreyashi Dey and the theatre actor and scholar Dheeman Bhattacharyya. A three day festival on Woman and Nature, recalling passages from traditional arts, from culture and lifestyle studies not omitting folklore, held at the IGNCA, saw the Sattriya exponent Mallika Kandali perform along with her group. Rhythmosaic Dance Therapy is celebrating NATIONAL CREATIVE ARTS THERAPY WEEK 2019 at various venues in Kolkata. It's an awareness camp for all to know more about the practice in movement therapy in various fields. - April 1, Bhubaneswar: Tridhara, Bhubaneswar presents group Odissi SHIVA IN ODISSI DANCE for Odia Mahothav. - April 2 - 8, Bangkok: Guru Gajendra Panda, Sudipta Panda, Madhusmita Pattnaik, D.Priyanka and Mokshada Tripathy present DEVI DASAVIDHAMI for BHARAT SANSKRUTI YATRA 2019. - April 7, Nagoya, Japan: SHIVATANDAV group Odissi by Tridhara, Japan for annual celebration, 6pm. - April 9 - 12, Bahrain: Guru Gajendra Panda, Sudipta Panda, Madhusmita Pattnaik, D.Priyanka and Mokshada Tripathy perform KRISHNAYA TUVYAM NAMAH for ODISHA DAY CELEBRATION, 6pm. - April 12, New Delhi: Guru Gajendra Panda and Kaori Naka (Japan) present HARA-GOURI ASTAKAM for Guru Paranam Utshav organized by Vaishali Kala Kendra Noida. - April 14, Bhubaneswar: Guru Gajendra Panda and Chaitra Dasegoda present duet Odissi ARDHANARISWAR and group Odissi GANANAYAKA PANCHAKA by Tridhara for inaugural day of BAISAKHI FESTIVAL. - April 15, Bhubaneswar: Guru Gajendra Panda and dancers of Tridhara present SAKHI GOPINATHA for inaugural day of CAPITAL DAY FOUNDATION. - April 22 - 28: Paris, Belgium, Netherlands, Switzerland: Guru Gajendra Panda and principal dancers of Tridhara present Odissi dance drama SRI GANESH for BHARAT SANSKRUTIK MAHOTSHAV, organized by HAMS. Geeta Chandran inaugurates Spicmacay's VIRASAT FESTIVAL with her Bharatanatyam performance. She will be accompanied by: Guru S. Shankar-nattuvangam; K. Venkateshwaran-vocal; Manohar Balatchandirane-mridangam; G. Raghavendra Prasath-violin. Kanaka Sudhakar and SUNAINA - Society for the Upliftment of National Arts of India - complete 25 years of service to promote Culture, Education and Research. There will be special short performances by Jayaprabha Menon, Mowmala Nayak, Kavita Dwibedi, Rajesh Saibabu, Aparajita Sharma, Abhinaya Nagajothy, Pritpal Singh and Suraj Paul. At: Triveni Kala Sangam, 6pm. - 6th April, 6pm: BRIHADEESWARA - FORM TO FORMLESS, through the eyes of a Devaradiyal' on Broadway. Sudarshan Chakravorty's schedule for his USA tour. - April 9: Sudarshan leads a Showcase & Sharing with students of San Francisco based choreographer Mary Carbonara and also discusses the collaborative production FROZEN ANGELS which Mary choreographed for Sapphire in March 2017 as part of INCRES (International Choreographer Residency in Sapphire). - April 11-13: Sudarshan leads a Community Workshop for Bangaliyana, a Bengali Community based organization in Fremont to promote Indian dances. - April 14: Celebrating Bengali New Year with dance, music and conversations sharing moments of productions and experience in working with the diaspora in USA. - April 17- 29: Sudarshan Chakravorty leads and choreographs around 100 dancers for the upcoming NABC (North American Bengali Conference) in July for the Opening Ceremony at various locations in Washington and Maryland. Schedule for Ramya Harishankar and Arpana Dance Company. Presented by Bookmyshow, the 16th century love saga MUGHAL-E-AZAM is directed by film-maker and playwright Feroz Abbas Khan with performances by an enviable cast, beautifully choreographed Kathak sequences by Mayuri Upadhya, mesmerizing music and intricate sets. Mughal-e-Azam captures the chronicles of Salim and Anarkali's classic love story with dazzling costumes by designer Manish Malhotra combined with the technical expertise of Broadway and original hit songs. Nirupama, Rajendra and Abhinava Dance Company present TAD-BHARATHAM - That! is India. Offered as a lasting experience of the beauty of nature and the Indian tradition well rooted in truth, the production is presented as a conversation between the Himalaya & the ocean. Dancers - Rohini Prabhath, Ashwin Prabhath, Neha Nath, Shreya Vathsa, Kinga Malec, Ramya Shree, Vishruthi Acharya and Naveen R Hegde. As part of the series of KALA SANGAM by Sanjali Centre for Odissi Dance, there will be a lec dem / panel discussion by Geeta Chandran, Madhu Nataraj, and Vyjayanthi Kashi, moderated by Anita R Ratnam. The session attempts to delve into the diverse evolutionary aspects of Indian classical dance forms over the last 20 years. Rhythmosaic School and Dance Institute presents a contemporary dance series SUBLIME featuring choreography by Prasanna Saikia and presented by Rhythmosaic Repertory. In its motive to spread social awareness towards cruelty to animals and its prevention, SUNAINA presents for Chandigarh Tamil Sangam, JAI GANESH by Guru Kanaka Sudhakar and senior disciples. SUNAINA presents in association with India Habitat Centre, HER STORIES, conceptualized and choreographed by Guru Kanaka Sudhakar & Aparajita Sarma, depicting stories of a lovelorn nayika, dilemma of Kaikeyi and today's empowered woman. ABHAI celebrates its 31st Annual Day at Narada Gana Sabha main hall, 10.30am. Abhinaya Dance Company restages STORIES OF JUSTICE which examined the non-violent resistance strategies of Martin Luther King, Jr.
At: the Asian Cultural Center in Oakland. The World Music Institute presents DANCING THE GODS, co-curated with Rajika Puri. - April 27 at 8pm: Rama Vaidyanathan and group present VIVARTANA - Transformations. At: Peter Norton Symphony Space, 2537 Broadway at 95th St.
Kalasagara UK presents TURN ON LIGHTS BEFORE YOU LEAVE, an evening of Bharatanatyam by the students of Usha Raghavan, Kalasagara UK, in celebration of Mother's Day and to raise funds for 'Gift of sight' program of the charity Navajeevan Blind Relief Centre, Tiruchanur, India. Mothers and their daughters along with some senior students perform.